Welcome to April! The Songkran Festival is just round the corner (13th April) and the weather is HOT, just as you'd expect. 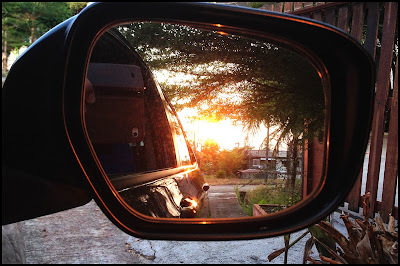 The last update on the Phuket weather blog was March 16th and we'd just had our first rain for over 2 months. It really has been a dry high season in 2014. On March 15th there was some afternoon rain for maybe 1 hour. Exciting news! Next day was a bit grey, but nice (for a local) to have a cooler day! On March 19th I Tweeted "Phuket weather - back to sun and blue skies the last 2 days after the clouds broke on Saturday and a grey Sunday." That week was again mostly very hot, but unlike the months before the "first rain" at least we had some clouds in the sky. On March 22nd, a Tweet "Such a hot day today ... The real "hot season" is here." - What is the HOT season? Well, it's NOW! It's when the northeast winds stop blowing, so you lose that cooling effect. The days are hot, and all that heat sometimes leads to thunderstorms. Often in the middle of the day or in the night. On the 22nd, 1 week since the last rain, we had a little rain in the night. I checked the rain gauge next day, it was only 8mm, compared to 15mm the week before. I do apologise if updates are sometimes a bit lacking - I am working 6 days per week in high season at Sunrise Divers. Sometimes forget to Tweet or take any kind of photo. Anyway, the weather in the week after 22nd March was again hot, sunny, nothing to report! 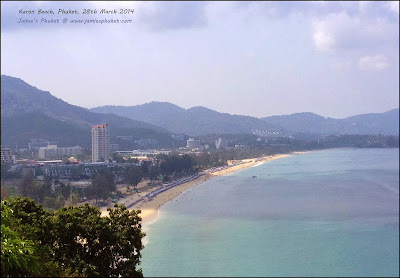 (above) Timelapse video showing weather at Patong Bay on March 26th, from the Webcam. (above) View over Karon Beach, March 28th. 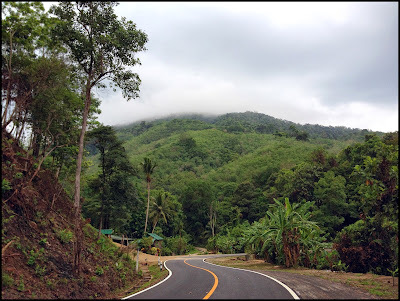 You get this view on the road to Karon from Patong. Always been a favourite view. On March 31st I Tweeted about the heat, and later in the evening "I can see flashes of lightning to the North. Must be raining somewhere! Where I am (Kathu) it's dry, hot and the air is still." 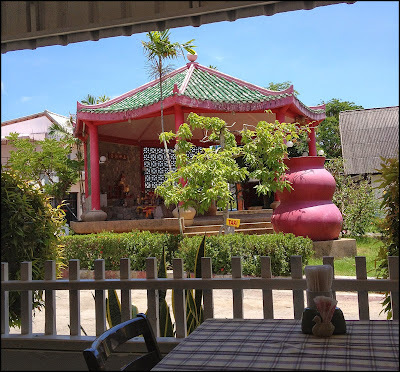 (Kathu is my area, it's in between Phuket Town and the hills, to the east of Patong beach). Now Like I say, heat + no wind = thunder. We did not get it on the 30th, but on the 31st we got some heavy rain, and there was even some localised flooding in some places round the island. Not that much at my house, but the power went off for an hour. The morning of the 31st was sunny, clouds started to gather, but there was no rain until the night. Was thundery and wet for an hour. I measured 25mm of rain. Exact rain does vary around the island. And while I had a 1 hour power outage, one friend told me at his house it was off for 5 hours. But on April 1st I was up early for my exercise at Bang Wad Reservoir. It's just over 6.5km to walk a circuit of the reservoir. On April 1st the clouds were hanging over the hills and the morning was nice and fresh. The April 1st Tweet "And this morning here at Karon beach, it's very grey with a few drips of rain falling. This really is the first grey, wet day for 3 months!" - no joke! We did actually have a grey day and then I suddenly got many messages via email, Twitter, Facebook .. people fretting about the weather. OMG! Rain! We're coming next week! Forecast says rain! Chill out. One wet day after 3 months of dry weather? What's to worry about?! April is normally HOT, very HOT. There will be occasional rain or thunderstorms, this is tropical weather. Phuket is a tropical island. Look at all the green jungly hills... how do they get so green? RAIN! But there's more sun that rain, there's really no reason to worry about the weather in Phuket. Yes we had a bit of rain this week. It was nice! A Tweet from later on April 1st "After last night's rain and a grey morning, the afternoon in Phuket was brighter and even sunny later on." - See? Nothing to worry about! A Tweet from April 4th "How was the weather in Phuket today? Started cloudy and grey and has got brighter. Now a sunny late afternoon." (above) Wet morning at home, April 5th. And when I got to Karon Beach, it was also very grey, but cleared up later. April 6th - yesterday, Sunday. HOT AND SUNNY. And I got sunburn working round the house for a couple of hours. A real scorcher of a day. And today, April 7th, has been the same. A cool, drizzly day now and then is very nice. But in April, most days will be hot and sunny. (above) My view at lunchtime today at the Sala Bua restaurant next door to Sunrise Divers. Weather forecast ... HOT AND SUNNY with some rain and thunder now and then. It's April. Enjoy the heat. Enjoy Songkran!